Anchorage Police Department, file photo. Over the weekend, a vandal ransacked an Anchorage school, causing at least $100,000 in damages. 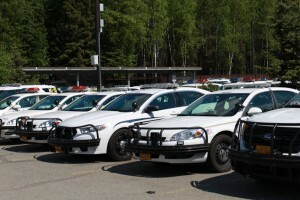 That’s according to the Anchorage Police Department, who say they responded to an alarm call late Saturday night at Alpenglow Elementary in Eagle River. “The damage inside the school was quite massive,” said APD spokesperson Renee Oistadt. Officers arrived at the school to find two broken exterior windows. About 20 iPads were also smashed. On Tuesday afternoon, APD announced it had identified the suspected perpetrator based on evidence gathered from the building. Because the suspect is a minor police have not identified him, but say charges have been sent to the Department of Juvenile Justice. According to Oistadt, vandalism incidents against schools increases slightly during the summer.